A prominent ledge punctuates the landscape towards the bottom of the Grand Canyon. It’s the Tapeats Sandstone, deposited during the Cambrian Period about 520 million years ago, when the ocean was beginning to encroach on the North American continent, an event called the Cambrian Transgression. Above the ledge, you can see more than 3000 feet of near-horizontal sedimentary rocks, eroded into cliffs and slopes depending on their ability to withstand weathering and erosion. These rocks, deposited during the rest of the Paleozoic Era, are often used to demonstrate the vastness of geologic time–some 300 million years of it. View of the Grand Canyon from the South Rim trail. Arrows point to the Tapeats Sandstone. 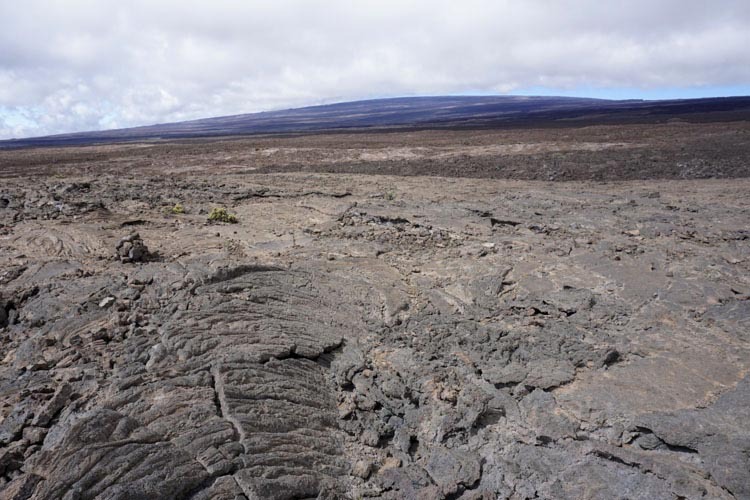 To get an idea of the immensity of Mauna Loa Volcano, take a look at the photo below. That rounded shape continues from its summit area at 13,678 feet above sea level to about 18,000 feet below sea level –and then another 25,000 feet or so below that because the mountain has sunk into the oceanic crust. It’s unquestionably the world’s largest active volcano. Briefly, Mauna Loa’s made of basalt. 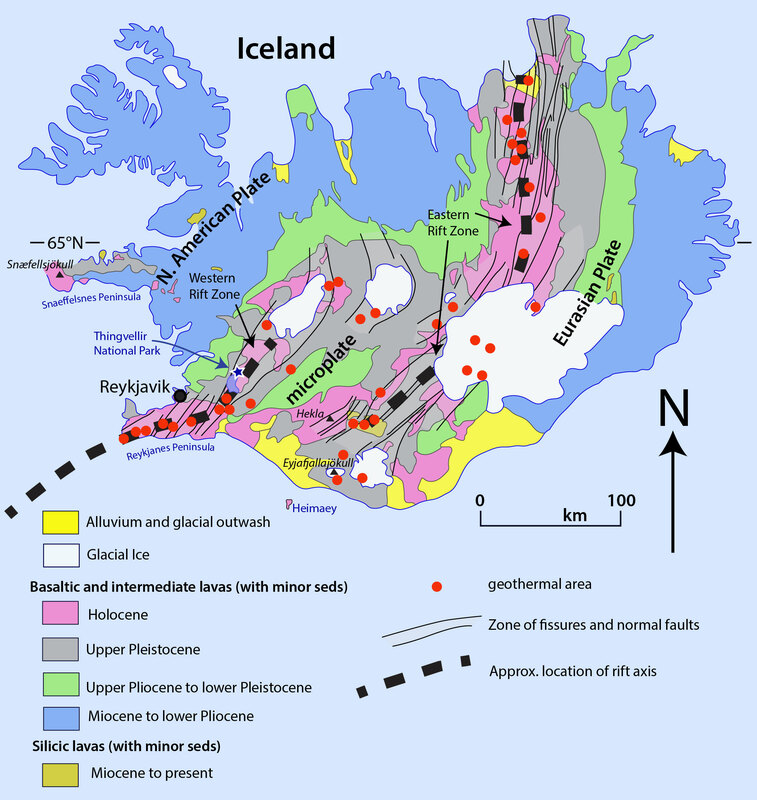 Basaltic lava flows, being comparatively low in silica, have low viscosities and so cannot maintain steep slopes, resulting in broad, relatively low gradient volcanoes called shields. With just a little imagination, you can see how Mauna Loa’s shape resembles that back side of some shield one of King Arthur’s Knights might carry into battle. What better way to kick off my new website than to write about it on my blog? To see it, you just need to click on the word “home” in the space above. Or you can click the link: geologypics.com. 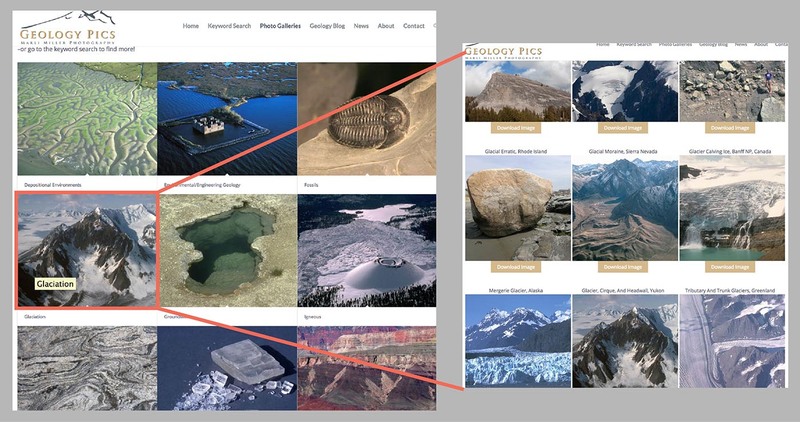 As it says, the site offers free downloads for instructors –and for anybody who’s craving a good geology photograph. It’s my way of contributing to geology education –showing off some of our landscape’s amazing stories and providing resources for other folks who want to do the same. I think the best part of the whole site is that red button in the middle of the home page. It says “Image Search by Keyword”. First page of sea stacks when you search on the term. A more detailed caption below the photo, along with its ID number appears at the bottom of the pic. This particular image is the chapter opener to the Coast Range in my new book “Roadside Geology of Washington“, which I wrote with Darrel Cowan of University of Washington. There are also galleries –a chance to browse a variety of images without having to think of keywords. Similar to the search, they’re presented as squares so you need to click on the photo to see the whole thing. Here’s what the photo gallery page looks like (on the left), followed by part of the “glaciation” page you’d see if you clicked on “glaciation”. Woohoo! Then there’s the “About” page, which gives some information about me and details my policies regarding use of the images (basically, you can download freely for your personal, non-commercial use if you give me credit; if you want to use the image in a commercial publication you need to contact me to negotiate fees). There’s also a “News” page, that gives updates on the website. There’s a contact page from which you can send me emails. And the blog? It goes right back to here! And finally, if you’re looking for a great web designer? Try Kathleen Istudor at Wildwood SEO –she created the site and spent hours coaching me on how to manage it. Mt. Baker, a glaciated stratovolcano in northern Washington State. 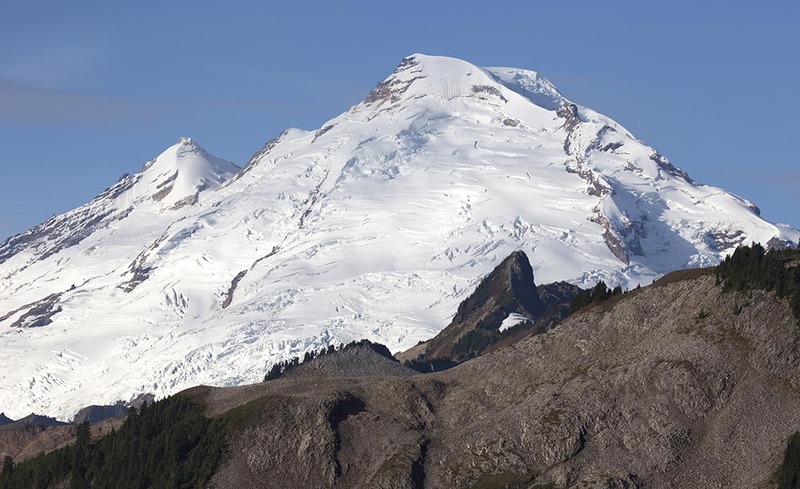 Mount Baker’s a stratovolcano that erupted its way through the metamorphic rock of the North Cascades. I took the photo from the parking lot at a spot called Artist’s Point –at the end of WA 542 –and my editor nixed it because I already had enough snow-capped volcanoes in the book. On the cross-section below–which includes elements of Oregon as well as Washington, Mt. Baker is represented by the pink volcano-shaped thing labelled “High Cascades”. The following 15 or so photos illustrate most of the other features on the cross-section –so together, they illustrate much of the geology and geologic history of the state! Generalized cross-section across Washington and Oregon. 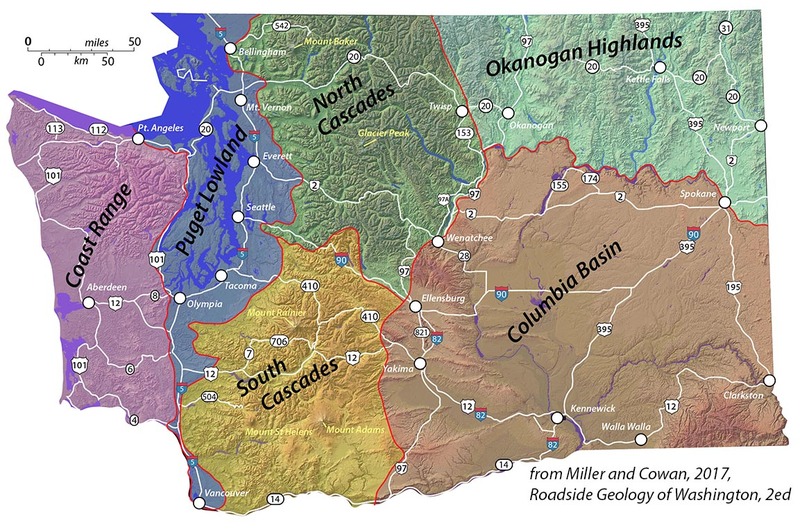 Washington State and geologic provinces. A quick note about organization: I’m separating the images according to their physiographic province. There are six in Washington: Coast Range, Puget Lowland, North Cascades, South Cascades, Okanogan Highlands, and Columbia Basin. 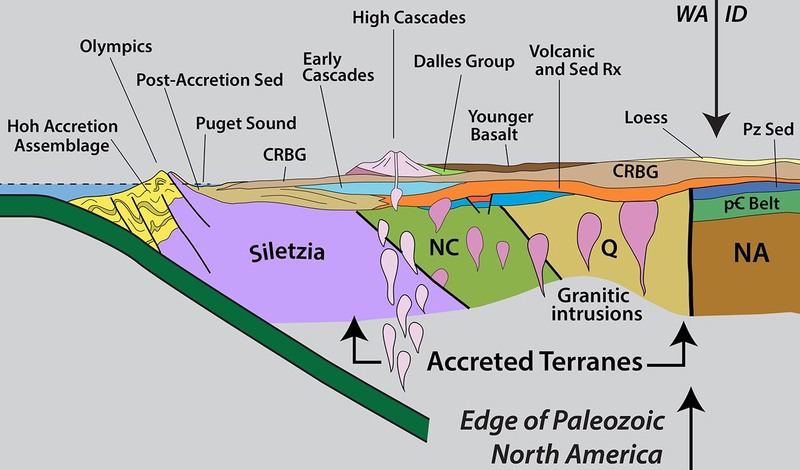 As you can see in the cross-section, the Coast Range borders the Cascadia Subduction Zone and consists of three main elements: the Hoh Accretion Assemblage in yellow, Siletzia (called the “Crescent Formation” in Washington) in purple, and the post-accretion sedimentary rock in brown. Siletzia is the oldest. It was thrust over the Hoh Accretion Assemblage, which is still being accreted at the subduction zone. The post-Accretion sedimentary rocks were deposited over the top of Siletzia after it was accreted about 50 million years ago. Washington’s waterfalls–behind each one is a rock! Of all the many reasons why waterfalls are great, here’s another: they expose bedrock! And that bedrock tells a story extending back in time long long before the waterfall. 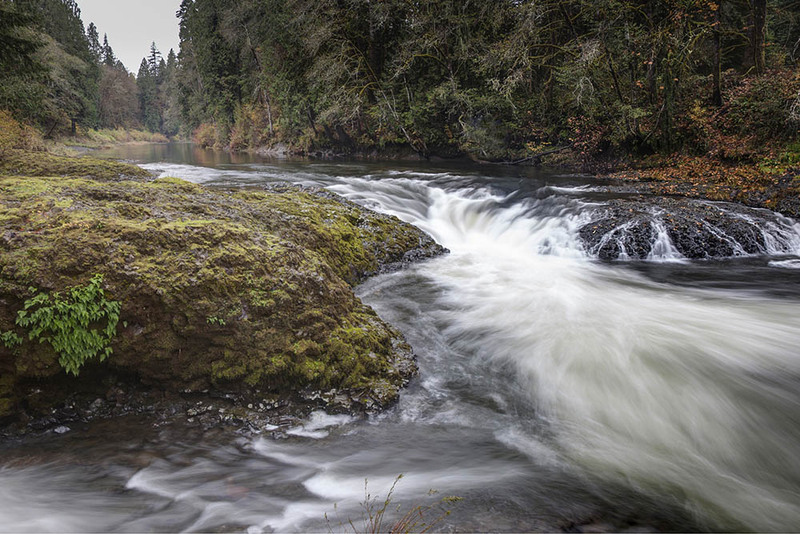 This posting describes 9 waterfalls that together paint a partial picture of Washington’s geologic history. The photos and diagrams will all appear in my forthcoming book Roadside Geology of Washington (Mountain Press) that I wrote with Darrel Cowan of the University of Washington. And waterfalls in heavily forested areas are especially great because they may give the only view of bedrock for miles around! Take Rainbow Falls, for example–the small waterfall on the left. It’s in Washington’s Coast Range along State Highway 6–a place where a roadside geologist could otherwise fall into total despair for lack of good rock exposure. But this beautiful waterfall exposes a lava flow of the Grande Ronde Basalt, which belongs to the Columbia River Basalt Group. Significant? Yes! 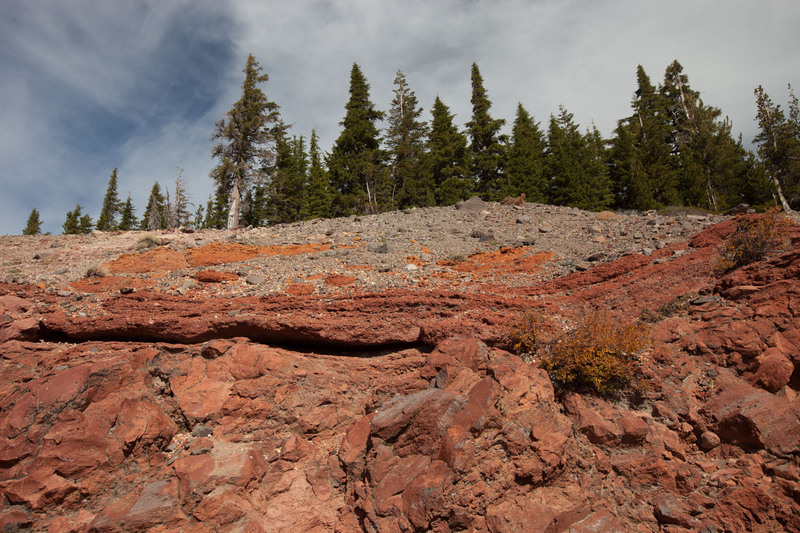 This lava erupted in southeastern Washington and northeastern Oregon between about 16 and 15.6 million years ago and completely flooded the landscape of northern Oregon and southern Washington. We know how extensive these flows are because we can see them–and they cover the whole region. The photo below shows them at Palouse Falls in the eastern part of Washington. 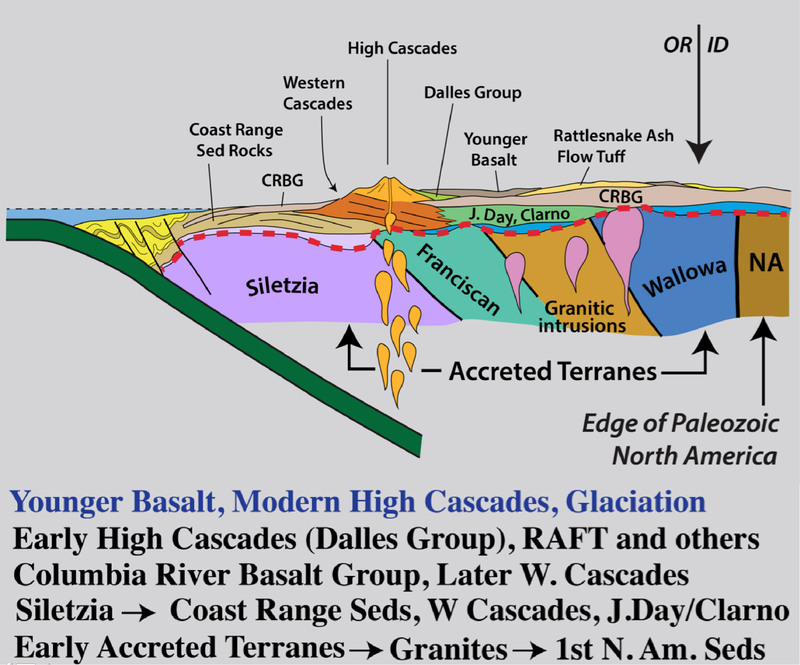 Take a look at my earlier blog post about the Columbia River Basalt Group? (includes 15 photos and a map). Landscape and bedrock… seems we seldom connect the two. We all like beautiful landscapes, but most of us don’t ask how they formed –and even fewer of us think about the story told by the rocks that lie beneath it all. Those make two time scales, the faster one of landscape evolution and the much slower one of the rock record. Considering that we live in our present-day human time scale, it’s no wonder there’s a disconnect! Take this photo of Mt. Shuksan in northern Washington. My daughter Meg and I drove up to the parking lot at Heather Meadows and went for a quick hike to stretch our legs and take some pictures just before sunset.We had about a half hour before the light faded –and all I could think about was taking a photo of this amazing mountain. But the geology? What?? 1. Mt. Shuksan and moonrise, northern Washington Cascades. Thankfully, I’d been there in September scoping out a possible field project with a new grad student, and had the time to reflect… on time. From the ridge we hiked, shown as the dark area in the lower left corner of the left-hand photo below, we could almost feel Shuksan’s glaciers sculpting the mountain into its present shape. Certainly, that process is imperceptibly slow by human standards. Mt. Shuksan: its glaciated NW side, summit, and outcrop of the Bell Pass Melange. But the glaciers are sculpting bedrock –and that bedrock reveals its own story, grounded in a much longer time scale. It turns out that the rock of Mt. Shuksan formed over tens of millions of years on three separate fragments of Earth’s lithosphere, called terranes. These terranes came together along faults that were then accreted to North America sometime during the Cretaceous. At the top of the peak you can find rock of the Easton Terrane. The Easton Terrane contains blueschist, a metamorphic rock that forms under conditions of high pressures and relatively low temperatures, such as deep in a subduction zone. Below that lies the Bell Pass Melange (right photo) –unmetamorphosed rock that is wonderfully messed up. And below that lies volcanic and sedimentary rock of the Chilliwack Group. Here’s another of my favorites from 2015: the Keystone Thrust! It’s an easy picture to take –you just need to fly into the Las Vegas airport from the north or south, and you fly right over it. It’s the contact between the gray ledgey (ledgy? ledgeee?) rock on the left and the tan cliffs that go up the middle of the photo. 2. Keystone Thrust fault, Nevada–gray Cambrian ridges over tan Jurassic cliffs. The gray rock is part of the Cambrian Bonanza King Formation, which is mostly limestone, and the tan cliffs consist of Jurassic Aztec Sandstone. Cambrian, being the time period from about 540-485 million years, is a lot older than the Jurassic, which spanned the time 200-145 million years ago. Older rock over younger rock like that requires a thrust fault. Talk about geologic history… the thrust fault formed during a period of mountain building during the Cretaceous Period, some 100-70 million years ago, long before the present mountains. And the rocks? The limestone formed in a shallow marine environment and the sandstone in a sand “sea” of the same scale as today’s Sahara Desert. We know it was that large because the Aztec Sandstone is the same rock as the Navajo Sandstone in Zion and Arches national parks. left: Limestone of the Cambrian Bonanza King Formation near Death Valley; right: Cross-bedded sandstone of the Jurassic Navajo Sandstone in Zion NP, Utah. So… the photo shows cliffs and ledges made of rocks that tell a story of different landscapes that spans 100s of millions of years. But today’s cliffs and ledges are young, having formed by erosion of the much older rock. Then I flew over it in about 30 seconds. At Beach 2 near Shi Shi Beach in Washington State are some incredible sea stacks, left standing (temporarily) as the sea erodes the headlands. 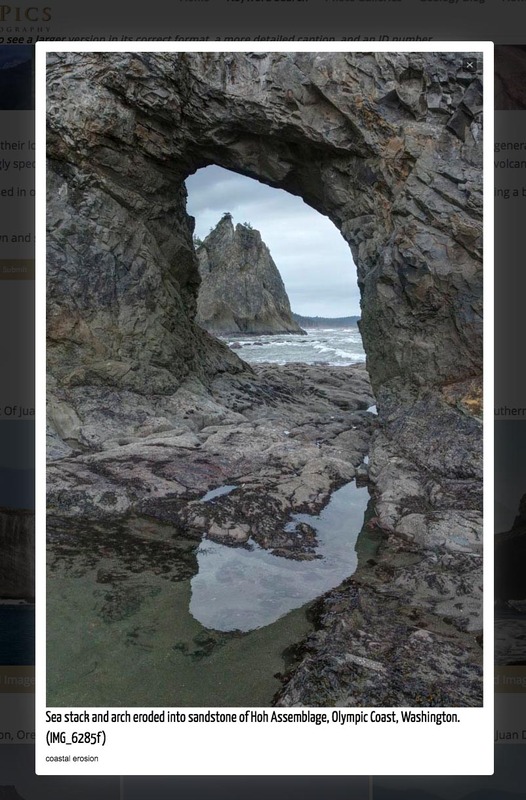 The sea stack and arch in the photo below illustrates the continuous nature of this erosion. Once the arch fails, the seaward side of the headland will be isolated as another sea stack, larger, but really no different than the sea stack to its left. And so it goes. 3. Sea arch and headland at Beach 2, Olympic Coast, Washington. And of course, the headland’s made of rock that tells its own story –of deposition offshore and getting scrunched up while getting added to the edge of the continent. Bedrock at Beach 2 consists mostly of sandstone and breccia. The white fragment is limestone mixed with sandstone fragments. And finally, my last “favorite”. It’s of an unnamed glacial valley in SE Alaska. My daughter and I flew by it in a small plane en route to Haines, Alaska to visit my cousin and his wife. More amazing landscape–carved by glaciers a long time ago. But as you can expect, the rock that makes it up is even older and tells it’s own story. 4. Glacial Valley cutting into Chilkat Mountains, SE Alaska. Of course, this message of three time scales, the human, the landscape, and the rock-record time scale applies everywhere we go. Ironically, we’re usually in a hurry. I wish I kept it in mind more often, as it might slow me down a little. Here’s to 2015 –and to 2016. To see or download these four images at higher resolutions, please visit my webpage: favorite 10 geology photos of 2015. Death Valley National Park– Geology Overload! Death Valley… I can’t wait! Tomorrow this time, I’ll be walking on the salt pan with my structural geology students, gawking at the incredible mountain front –and soon after that, we’ll be immersed in fault zones, fractures, and fabrics! Death Valley salt pan at sunrise. Death Valley presents incredible opportunities for all sorts of geology, especially geologic time; you can look just about anywhere to see and feel it. Take the salt pan. It really is salt –you can sprinkle it on your sandwich if you want. It’s there because the valley floor periodically floods with rainwater. As the rainwater evaporates, dissolved salt in the water precipitates. 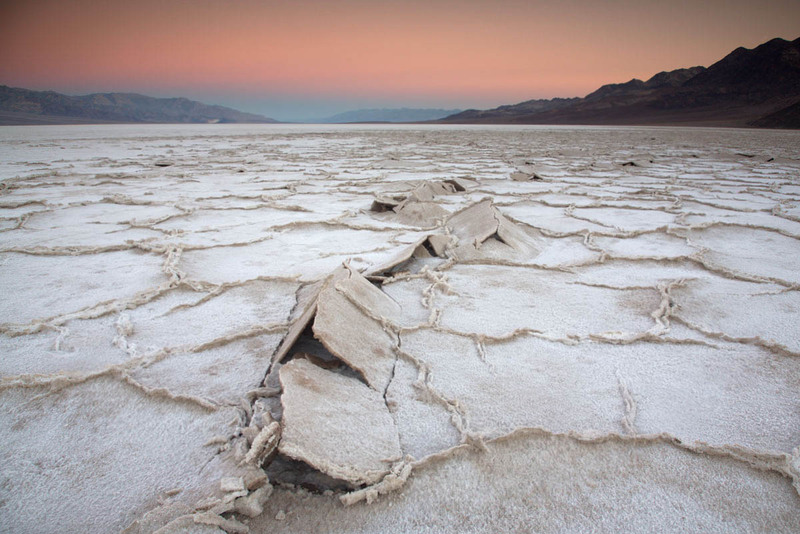 And some 10,000 years ago, Death Valley was filled by a 600′ deep lake, which evaporated, leaving behind more salt. Before that, more shallow flooding and more lakes. Aerial view of faulted front of the Black Mountains. But the basin is more than 4 miles deep in some places! It’s not all salt, because there are a lot of gravel and sand deposits, but a lot of it is salt. That depth speaks to geologically fast accumulation rates, because it all had to accumulate since Death Valley formed –probably in the last 2 or 3 million years. But still, 2 or 3 million years is way past our realm of experience. Hiker in the Funeral Mountains of Death Valley. To really go back in geologic time though, you need to look at the mountains. Most of the mountains contain Upper Precambrian through Paleozoic sedimentary rock, most of which accumulated in shallow marine environments. 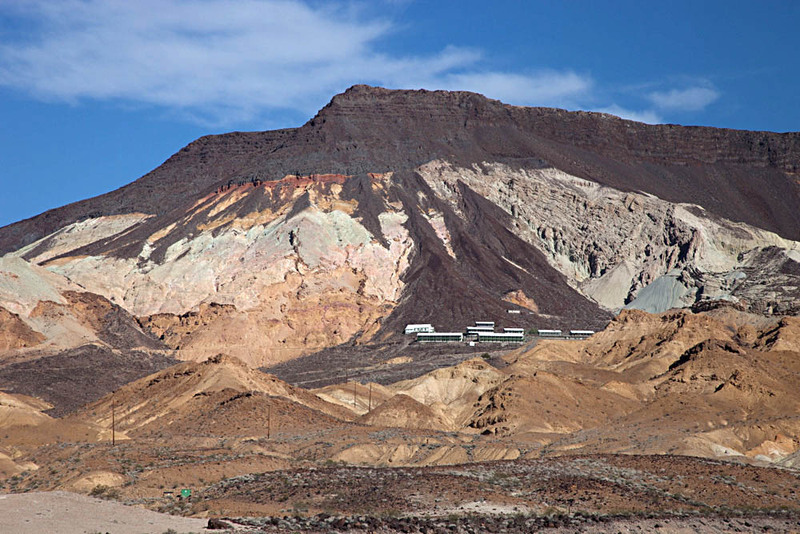 There’s a thickness of more than 30,000 feet of sedimentary rock exposed in Death Valley! Deposited layer after layer, you can only imagine how long that took. We can measure the thickness of the rock because it’s no longer in its original horizontal position. The ones in the photo above were tilted by faulting –which occurred during the period of crustal extension that formed Death Valley today. 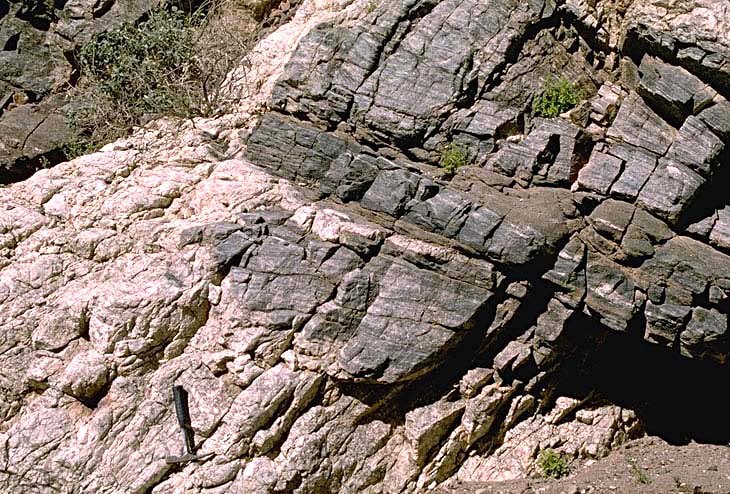 The rocks in the photo below were folded –by a period of crustal shortening that took place long before the modern extension. The folding occurred during the Mesozoic Era –more than 65 million years ago. 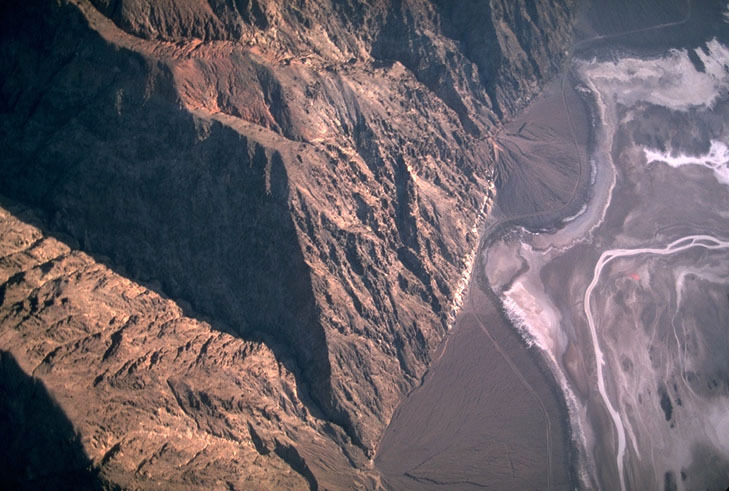 Aerial view of Titus Canyon Anticline. Above the Upper Precambrian to Paleozoic rock are thousands of feet of volcanic and sedimentary rock, tilted and faulted, but not folded. They reveal many of the details of the crustal extension that eventually formed today’s landscape. For example, the photo below shows Ryan Mesa in upper Furnace Creek Wash. In this place, the main period of extensional faulting predates the formation of modern Death Valley. Look at the photo to see that faulting must have stopped before eruption of the dark-colored basalt flows. Notice that there has to be a fault underneath the talus cones that separates the Artist Dr. Formation on the left from the Furnace Creek Formation on the right. Because the fault does not cut the basalt though, it has to be older. 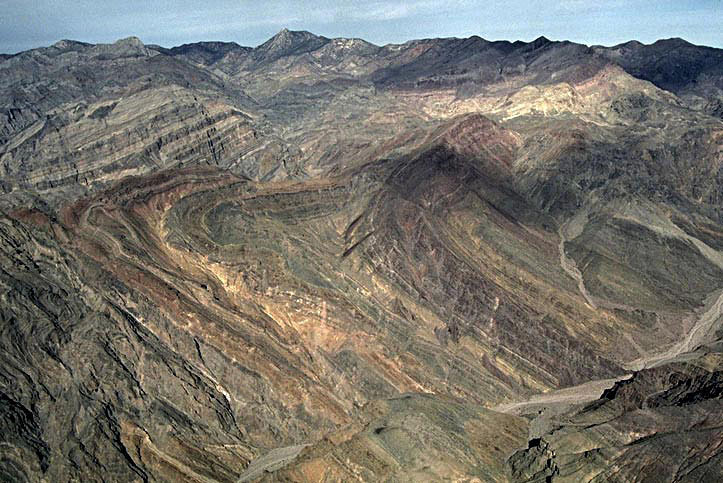 Those basalts are 4 million years old, older than modern Death Valley. –And that’s the old mining camp of Ryan perched on the talus. Angular unconformity at Ryan Mesa: 4 Ma basalt flows overlying faulted Artist Drive (left) and Furnace Creek (right) formations. And beneath it all? Still older rock! There’s some 5,000 feet of even older Precambrian sedimentary rock, called the “Pahrump Group” beneath the 30,000 feet of Upper Precambrian and Paleozoic rock–and below that, Precambrian metamorphic rock. It’s called the “basement complex” because it’s the lowest stuff. Here’s a photo. The pegmatite (the light-colored intrusive rock) is actually quite young–I think our U-Pb age was 55 Ma –but the gneiss is much older, with a U-Pb age of 1.7 billion years. Billion! Forget about the U-Pb age though. These rocks form miles beneath Earth’s surface –and here they are, at the surface for us to see. Without knowing their age, you’re looking at deep geologic time because of the long period of uplift and erosion required to bring them to the surface. And it happened before all those other events that described earlier. –or better yet, type “Death Valley” into the geology photo search function on my website! Just scratching the surface. A geologic cross-section of Oregon speaks to unimaginable events. The cross-section below runs from the Cascadia subduction zone across Oregon and into eastern Idaho. It outlines Oregon’s geologic history, beginning with accretion of terranes, intrusion of granitic “stitching plutons”, and deposition of first North American-derived sedimentary rocks, and ending with High Cascades Volcanic activity and glaciation. Schematic geologic cross-section across Oregon, from the Cascadia Subduction zone into western Idaho. The cross-section barely scratches the surface of things. Moreover, it boils everything down to a list, which is kind of sterile. But the cross-section also provides a platform for your imagination because each one of these events really happened and reflects an entirely different set of landscapes than what we see today. Think of the CRBG about 15 million years ago. The basalt flows completely covered the landscape of northern Oregon and southern Washington. Or the Clarno volcanoes –only a part of the green layer called “Clarno/John Day”. 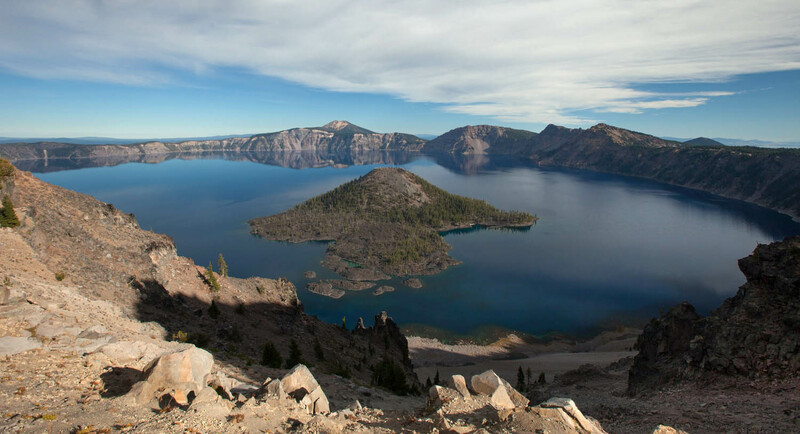 They were stratovolcanoes in central Oregon –when the climate was tropical! Or try to wrap your mind around the accreted terranes, some of which, like the Wallowa Terrane, contain fossils from the western Pacific. To emphasize this point, here’s Crater Lake. Crater Lake formed because Mt. Mazama, one of the Cascades’ stratovolcanoes, erupted about 7700 years ago in an eruption so large and violent that it collapsed in on itself to form a caldera. It’s now a national park, with a whole landscape of its own. And if you visit Crater Lake, you’ll see evidence that Mt. Mazama had its own history –which dates back more than 400,000 years. But Crater Lake and Mt. Mazama make up just a tiny part of the Cascades, which are represented on this diagram by just this tiny area that’s shaped like a mountain. 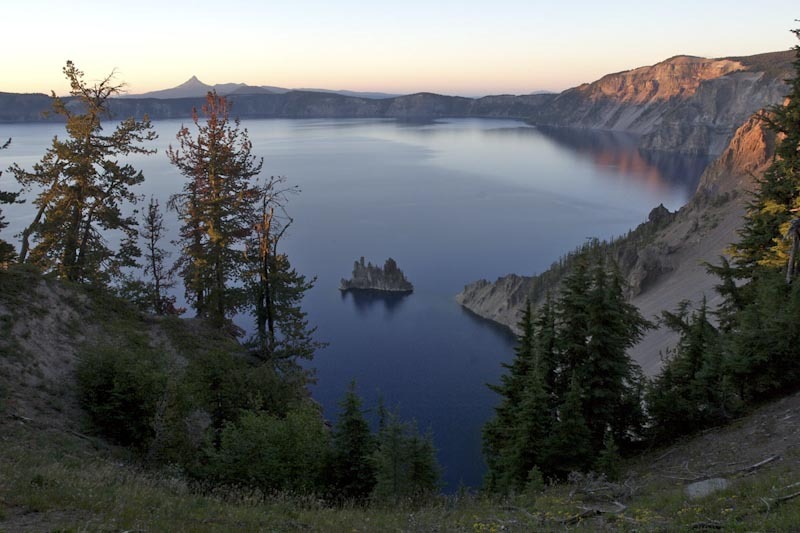 Crater Lake occupies the caldera of Mt. Mazama, which erupted catastrophically some 7700 years ago. So the cross-section is kind of sterile and just scratches the surface. But what makes geology so incredible is that we’re always learning new things and digging deeper –and we know we’re just scratching the surface –that there will always —always— be something to learn. 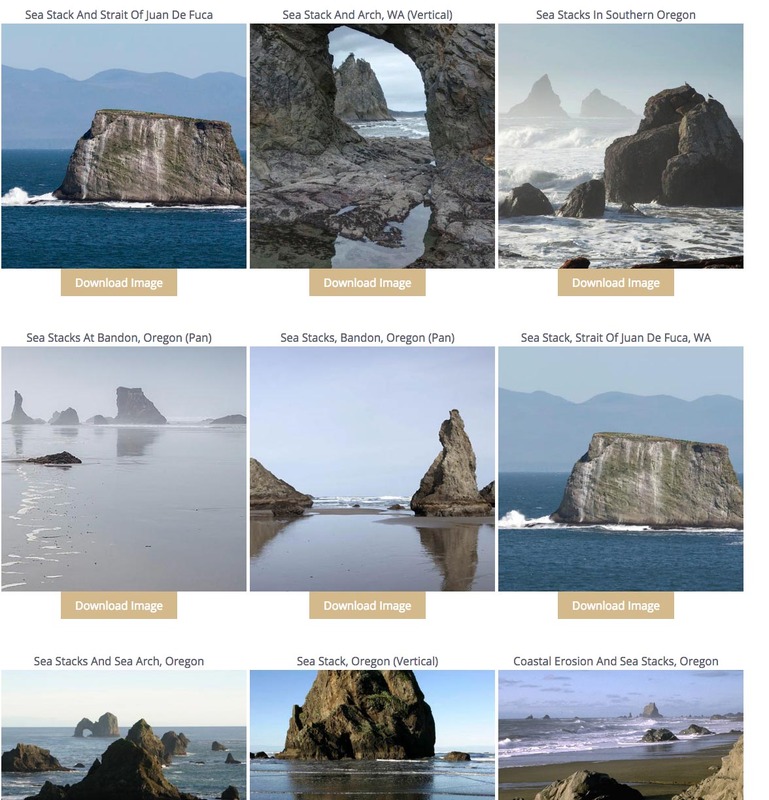 click here and type “Oregon” into the search for photos of Oregon Geology. click here for information about the new Roadside Geology of Oregon book.